Florida to Virginia Freight shipping and trucking services are in high demand; Miami to Arlington is a very heavily traveled route. The Miami, FL to Arlington, VA shipping lane is a 1,051 mile trip that takes more than 15 hours of driving to complete. Shipping from Florida to Virginia ranges from a minimum of 503 miles and over 7 hours on the road from Becker, FL to Skippers, VA, to over 1,140 miles and a minimum of 17 hours on the road from Homestead, FL to Reynolds Store, VA. The shortest route from Florida to Virginia is along the I-95 N; however, there’s also a more northerly route that uses the I-77 N, passing through Charlotte, NC instead of Richmond, VA.
Florida is a state that has an incredibly long coastline with many islands and peninsulas. Most of the state has a sub-tropical climate, with temperatures that often top 100° F in the summer. Most major shipping and trucking delays in Florida are related to hurricanes and tropical storms, which regularly affect various part of the state, especially on the east coast. Look out for hurricanes and tropical storms from June through November. Florida’s largest cities, all with populations of over a million in their metropolitans areas, are Miami, Tampa, Orlando and Jacksonville. However, Florida has many medium-sized cities and industrial areas along its coasts; shipping tends to be distributed over a large area in Florida. 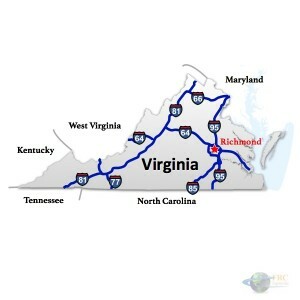 Virginia sits on the Atlantic Coast of the United States and is commonly referred to as “The Old Dominion”, which was named for being one of the oldest overseas dominions of the King and Queen of England. With agriculture occupying over 30% of the land in Virginia, a large part of the states income comes from soy, hay, peanuts, and tomatoes being the most profitable crop in the state, at one time tobacco used to be the number one grown crop in the state, while no longer the case the state is still the fifth- largest producer of tobacco in the nation. Virginia’s main industry is the technology sector, with the computer chip being the highest grossing export since 2006 and the fourth-highest number of technology workers in the United States, only California, New York, and Texas remain higher, technology quickly took over as the states main export while surpassing the state’s traditional top exports of tobacco and coal combined. To coincide with Virginia’s position in the technology industry, The Pentagon, which is located in Arlington, is the headquarters of the Department of Defense, while the Central Intelligence Agency in located in Langley, Virginia. Virginian is also home to several other government agencies, the United States Geological Survey, the National Science Foundation, and The United Sates Patent and Trademark Office, with all of these agencies and roughly 12% of all U.S. federal procurement money being spent in the state, providing over 900,000 jobs throughout the state and government contracts. Florida to Virginia Freight shipping quotes and trucking rates vary at times due to the individual states industry needs. Since Florida is mainly agricultural, and Virginia is mostly industrial, with many food processing and distribution centers, we see plenty of shipments by refrigerated trailer. We also see a number of flatbed shipments as well as by the more common dry van trucks. 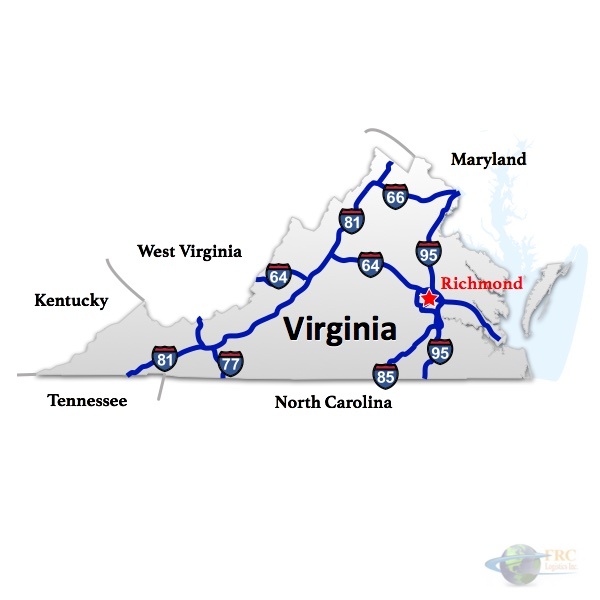 Our Less Than Truckload (LTL) carriers in both Florida and Virginia are also running a number of regular services between the two states, and it’s an active route for heavy haul freight shipments, as well.